None of us like to think about it, but some of us at some time in their life have to consider dentures. This is not to say it is an inevitability for everyone. 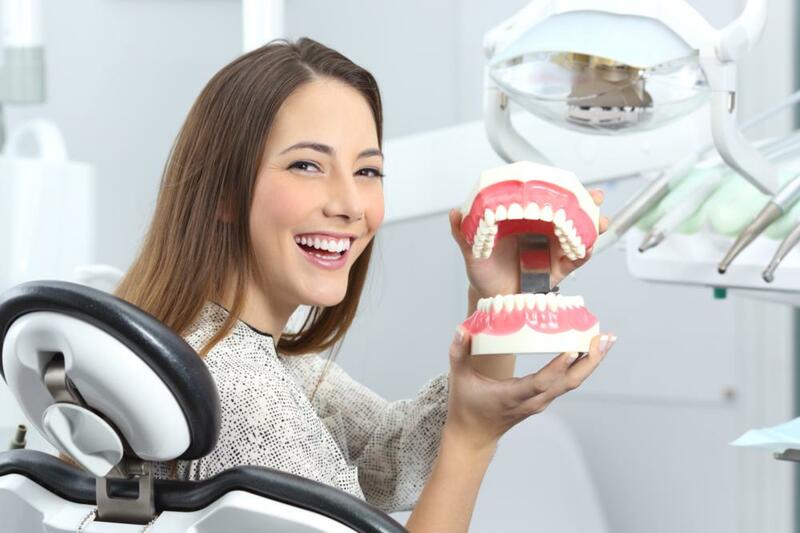 There are plenty of methods you can do now and in the future to prevent the need for dentures. It all starts with regular visits to your dentist, every six months on schedule. Even with regular dental cleaning and checkup, it may be wise to get evaluated for dentures. Here are the warning signs that might indicate the need for dentures. The precursors to the need for dentures are easily spotted. If you’re experiencing one or more of these right now, we encourage you to head to your dentist for a consultation right away. The first and most obvious sign is a substantial toothache that won’t go away. This toothache could signal decay that has made it’s way to your nerve and is causing severe discomfort. While a root canal may be a viable option to save the tooth, sometimes the tooth has decayed beyond the point of salvage, which will then require a dental implant or dentures. Sensitive gums that are red and swollen are usually the first warning sign of something worse – periodontal disease. While early signs of gum disease or gingivitis can be easily treated with a thorough cleaning and preventatives like prescription toothpaste and mouthwash, the further gum disease progresses, the worse it gets. If left untreated, bone loss begins to occur which results in both tooth loss and the need for dentures. The best protection against periodontal disease is prevention, which is a great reason to visit your dentist right now if you’re experiencing these symptoms. If gum disease advances too far, you’ll have no choice but to resort to dentures. If your teeth are loose or shifting noticeably, this could be a sign that dentures are in your future. Loose teeth usually signal decay and may be a consequence of periodontal disease. Because you can’t see below the gums, there may be significant damage occurring without you noticing it. The same goes with gaps growing wider between your teeth. If there are gaps growing steadily between your teeth, you need to ask your dentist about it. One symptom that may be a less-obvious indicator of the need for dentures is painful chewing, especially when you eat hard or chewy foods. This is a sign that your teeth may have significant damage. Another sign of decay most people aren’t aware of is chronic indigestion. Because your teeth aren’t functioning properly and it is harder to chew, you’re more likely to take larger bites which lead to stomach pains. If you’re experiencing either or both of these symptoms, it’s time to visit your dentist for a consultation. You have a missing tooth! If you’ve already lost a tooth or several teeth, the need for dentures is immediate. The more time you go without dentures, the more risk you run of losing additional teeth. Without the support of all your teeth, the remaining healthy teeth shift faster and become weaker. If you’re missing teeth but haven’t addressed the need for dentures yet, now is the time to investigate treatment options with your dentist. There are a few different options you can resort, your dentist should determine your need for the dentures. When you haven’t experienced substantial tooth decay, partial dentures are the better option. These dentures only replace a portion of your teeth and rely on healthy teeth around the denture for support. They are anchored by precision metal clasps that your dentist sets up. Partial dentures do a good job of looking like normal teeth, and they prevent nearby healthy teeth from shifting or moving any further. Full dentures are the variety we’re most familiar with. You can only wear conventional dentures once your gums have healed after extractions. It takes about two months or more for your gums to heal enough to support conventional dentures. While we think of dentures requiring adhesive to wear, most modern dentures have integrated supports that allow you to wear them without adhesive. These type of dentures are best for those who have lost all their top or bottom teeth. You don’t necessarily have to resort to dentures to correct missing teeth. Dental implants are becoming more common and affordable for patients with failing teeth. Unlike dentures, dental implants are firmly fixed in your bone, and they are a permanent fix for missing teeth. While they may be a better option for some patients, they are more expensive than any denture option. Some patients may not have enough bone strength to support dental implants, which makes dentures the best course of treatment. Now that we’ve covered all the reasons or signs you might need dentures, it is time to focus on the positives. Dentures can be extremely helpful for patients in a variety of ways. The most immediate is increased confidence when they smile and better speech when they talk. Aside from increased confidence, dentures provide a healthier shape for your face. When patients lose their teeth, their face can become saggy and look older. However, dentures can retain the healthy shape of the face, ensuring that the patient looks normal and even younger than they looked before dentures. Dr. Priyanka Shinghore Dental Director of Sabka dentist says “Replacing your bad teeth with denture will save your mouth and general health”. Dr. Rupali Gujar Dental Director of Sabka dentist says “Denture will restore the chewing function and confidence of the bright smile”. Dr. Reena Waghela Dental Director of Sabka dentist says “Badly infected teeth can spread the infection to the entire body. So dentures will ensure your healthy mouth”.